Just gotta accept it then 🙁 – autumn’s here, and here to stay… in northern Germany anyway. If you live in warmer climes then… lucky you! Not jealous… much. Anyway, this recipe is one last grasp at summer before its tendrils vanish for another year. It’s a light, bright salad with a citrus kick. The soft avocado contrasts perfectly with the crunchy, tangy tomatoes while the rocket and balsamic sauce flesh it out and add extra flavour. And the best thing about it? It’s all taste, and it’s all vegan. Yep no little animals killed, maimed or trapped in order to produce it. Isn’t that awesome? It’s great as a side dish to part of a larger meal, or with a little wholegrain toast on the side. Alternatively, if you’re looking for a lightweight, standalone meal then this one is a great place to start. Today’s section is devoted to the lovely avocado. It’s an incredible fruit that comes with a whole host of health benefits, but the one I’m gonna focus on now is the way it combines with other foods to get the best out of them. Cartenoids, found in abundance in things like rocket (rucola/arugula) or other leafy greens are packed with them. They’re strong antioxidants and can help lower cancer and heart disease (1). That’s amazing of course, but it’s important to know they won’t work properly without some kind of fat to help absorb them (2). And rocket carries very little fat of its own, naturally. That’s where avocados step up. They’re full of these ‘healthy’ or ‘good’ fats (monounsaturated) that you hear about so often, and so when combined in a salad they make sure you’re really getting all that leafy goodness from your greens. Put the sunflower seeds in a saucepan over a low heat. They only need 3 or 4 mins, don’t forget about them! While they’re toasting grab the rocket, give it a quick rinse and pat or drain dry. Slice the avocado(s) open, remove the stone, and scoop out the flesh. Cut it into little chunks, roughly 2cm each. Drip the lemon juice and a bit of salt and pepper onto the chunks. The seeds should be done by now, time to serve. Layer the rocket into a wide bowl, followed by the tomatoes and avocados. Sprinkle the seeds over the bowls next. Add a little more salt and pepper, drizzle the oil then balsamic cream/vinegar over the top and…..you’re done! Optional: Serve with a slice or two of whole grain toast if that’s what you fancy. Love it! The perfect combo of flavors! Our tomatoes are still going strong here, but the cooler temps are definitely rolling in. I love it! Yep great combo 🙂 I want a few more weeks of sun before we give in to the harsh Hamburg winter! Love these two veggies…and the sunflower seeds give just the right crunch. They do, don’t they? Love them, especially roasted for a couple of mins! I love a good refreshing salad! And arugula is one of my favorite things! Anything with tomatoes and avocado is a winning combination in my book. Looks delicious! I could eat this salad everyday! Thanks for sharing. 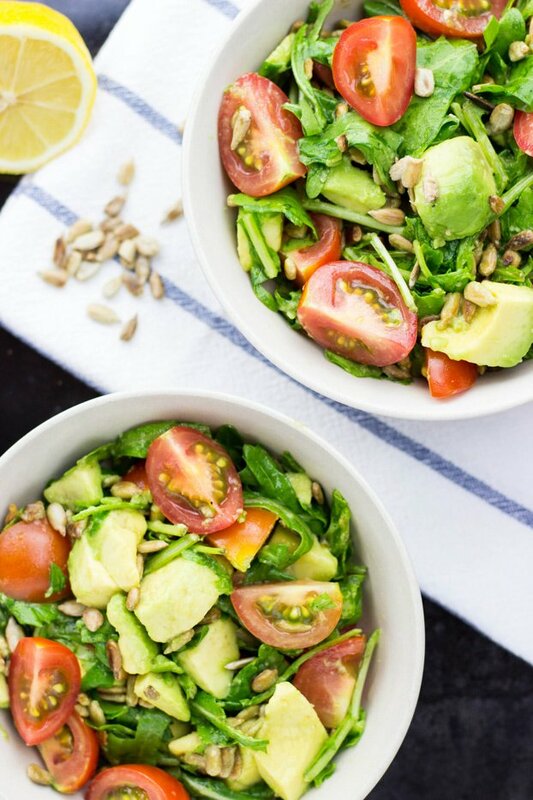 I love the combination of tomato and avocado! 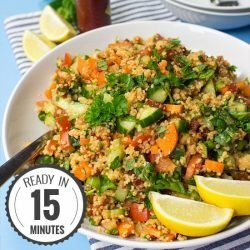 This salad looks so great! 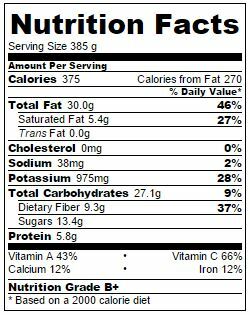 I love this salad and I am grateful that you shared the nutritional content as well. I could eat an avocado every day especially in a salad like this. Looks wonderful! I’m so sad to say goodbye to balmy nights. This gorgeous salad is the perfect farewell to summer. Although I’d eat it all winter long. I can so get behind any salad that involves avocado! 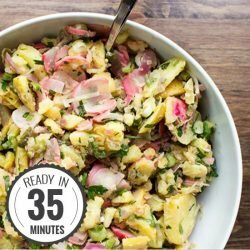 This sounds fantastic – it’d make for the perfect quick and easy lunch and of course I love how healthy it is. 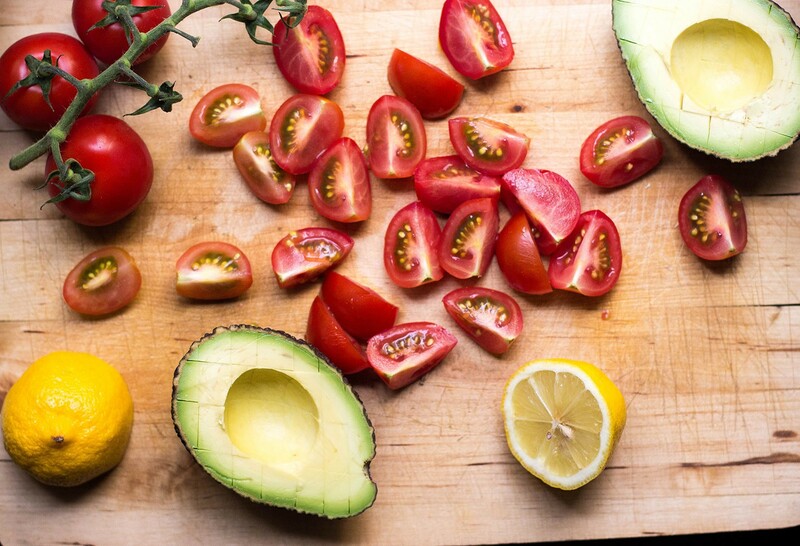 Okay – so this avocado tomato salad just looks AWESOME! Amazingly simple recipe with maximum taste. Thanks for sharing this!!! 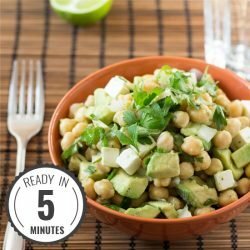 I love anything with avocado and this salad combination looks delicious!! I smiled when I saw your recipe. This was my lunch for WEEKS on end a few years ago. Delicious combination! Simple, easy and delicious. Perfect! I love fresh and healthy salads that show off beautiful produce. I have to make this one! 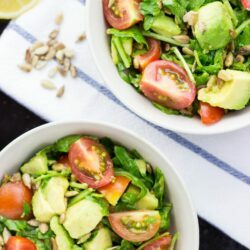 So refreshing and delicious – I love anything with avocado — this looks like a totally perfect lunch! I have a tonne of cherry toms from the garden… guess this salad will be made soon! Great looking salad! I love avocados and could eat them all the time. <3 Now I want to eat this salad. Right now! This salad does look so refreshing! I am not a huge fan of sunflower seeds but I’m guessing it would still be fab with pine nuts as a substitution! I have them every now and then though, since they are worth their money!! Who could resist a bowl of something like THIS?! 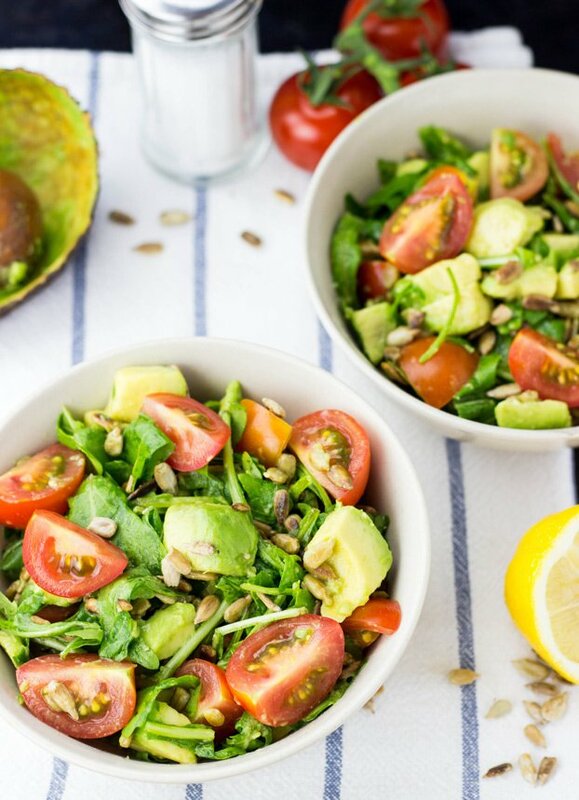 Vegetarian or otherwise, this avocado salad looks entirely healthful and inviting. What a great site you’ve put together, congrats to you all on your efforts and hard work it is impressive and inspiring, all in one!